Honda is also trying the strategy to conquer markets by introducing lite versions of superbikes.The success yamaha got when introducing R15,the stripped down version of R1 may be the inspiration behind the move.CBR250 is a similiar version of VFR which got international attention due to it's technical excellence and style has been the front runner of this trend.And now another CBR with a 150 cc engine.Only time will tell whether CBR150 will be a threat to Hero Karisma and R15. Only the trained eye can find the difference between CBR150R and CBR250 on first glance.Y shaped headlamp, fairing, engine caul, tail lamp etc has been copied from CBR250.A way to distinguish the two is by checking the silencer.CBR150R has got the shorter one.It's design is in sporty style in aluminium finish.Another aspect is black coloured alloy wheels.The machine is available in four different graphics and colours. Instrument panel is both digital and analog.Silver finishes have been avoided from the panel copied exactly from CBR250.Digital cluster that comes in orange backlit consists of speedometer, fuel guage,trip meter etc.Tachometer is in analog.The main defect in production is it's switches that are exactly stunner switches.Also kill switch has been removed.Other than the defects which came because of honda's cost cutting strategy, the vehicle is a better deal than other competing models. 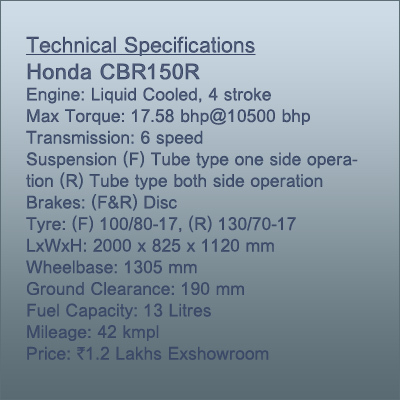 149.4 Liquid cooled four stroke DOHC engine delivers 17.58 bhp power @ 10500 rpm.The highest torque is 12.66 Nm@ 8500 rpm.The motorcycle weighs 136 kilograms only.The sporty riding position has given racing feel of honda.Even though CBR150R has got 2 kg weight more than R15, it has better stability in city traffic and at high speeds.Pillion rider has also got no complaints.Tube time suspension and 190 mm road clearence make it indian road friendly.Six speed gear transmission and 1305 mm wheel base gives more stability at sharp bends.276mm, 220mm front,rear brakes works good.Wide MRF tubeless tires is used in this vehicle.CBR150R is available in standard and deluxe variants.The exshowroom prices of standard and deluxe models are 1.22 lakhs and 1.23 lakhs respectively. 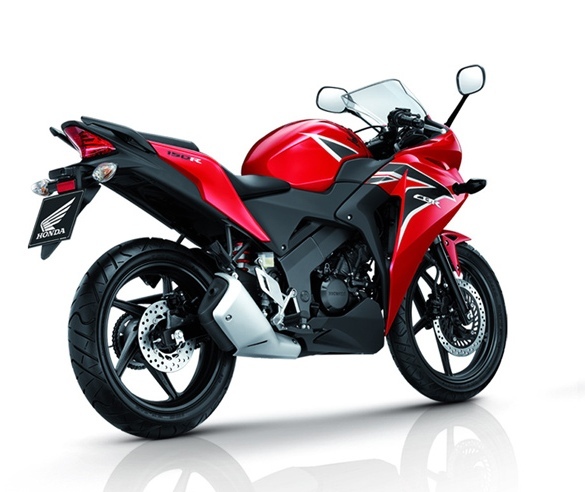 Honda CBR150R is a challenge to it's competing models because of it's style and power.Company offered mileage of 42 kmpl and trusted brand value of honda makes sure it succeed.